Burlington artist Aaron Stein is ready to crush it. "It" being his 1995 Buick Century named Eunice Bloom, which he has been driving for the past six months. What could motivate someone to ruin, on purpose, a possession so large and valuable? For Stein, it's just another day's work. In his studio in the South End's Soda Plant, he regularly smashes, tears, cuts and rips up old car parts. "I love the creative process of destruction," he says. "In my artwork I use a lot of automotive found objects, toy cars, and a lot of them I wreck." License plates feature prominently in Stein's work because, he says, "they're so accessible to everybody; everyone's got an association to them." His latest project, aptly titled "The Big Hit," is preparing Eunice Bloom for a run in the Champlain Valley Fair's Bond Auto Parts Demolition Derby this Wednesday, August 27. According to Stein, who has attended the derby for 20 years, it started out with the simple, if eccentric, desire to drive and crash. He traces his fascination with wrecking cars to early childhood, when he would smash toy cars and observe the shapes that resulted. "I'm really fascinated with how metal crumples uniquely," Stein says. "Each car looks the same when it comes out of the factory, but every car has its own life and its own life story. If they're in an accident and they get wrecked, no two wreck the same." Stein's artwork explores the relationships people have to their cars and what cars represent: childhood memories, teenage freedom or a life-defining moment such as a cross-country trip or a move. Automobile culture also has darker aspects, of course, such as the high social value placed on owning a car despite its environmental effects. In his art, Stein addresses that conflict and invites viewers to examine their own attachments, both personal and abstract, to the vehicle. Entering the derby presented an opportunity to manifest his art on a larger canvas, so to speak. Stein's partner, Marie Davis, a polymer clay artist and owner of Marie Davis Designs, says, "Aaron's been smashing toy cars forever, and the light went on when he realized he could actually do a full-size crash." After he'd acquired a car and started to plan for the big day, Stein found that many of his supporters and friends wanted to make the crash into something bigger, better and badder. He enlisted local design company Gotham City Graphics to design and paint the car, and secured sponsors, including T-shirt screen-printer Amalgamated Culture Works and the South End Arts and Business Association, to display their logos on the vehicle. Eunice Bloom is now navy blue and bright orange, with white flames licking the front doors. That last color choice is required by derby rules, Stein says: Because drivers are not allowed to hit each other's doors, every car must have a "white flag." The finishing touches will be removing the headlights and all exterior glass parts. Of course, Stein will keep the plates on, so they can be part of the story. Eunice Bloom has also helped others tell their car stories. For the last month and a half at ArtsRiot's Friday night Truck Stop on Pine Street, Stein has turned the car's backseat into a pop-up studio. His friend Rob Hunter, director of Frog Hollow VERMONT State Craft Center, has filmed two dozen vignettes of individuals sharing auto memories, good and bad. "A lot of the piece for me is to evoke a response from people," Stein explains. "Wrecking things — taking this car, which is in decent shape, and wrecking it — is emotional. I wanted to play with people's feelings and attachment to inanimate objects, because I don't think anything's precious, except life." Though Stein intended to make the audience question its attachments, he was surprised to find he, too, had formed a connection with his car. "What I didn't expect was my personal attachment," Stein admits. "I actually thought I'd be playing with everyone else, and now I have to go through with [the crash]." 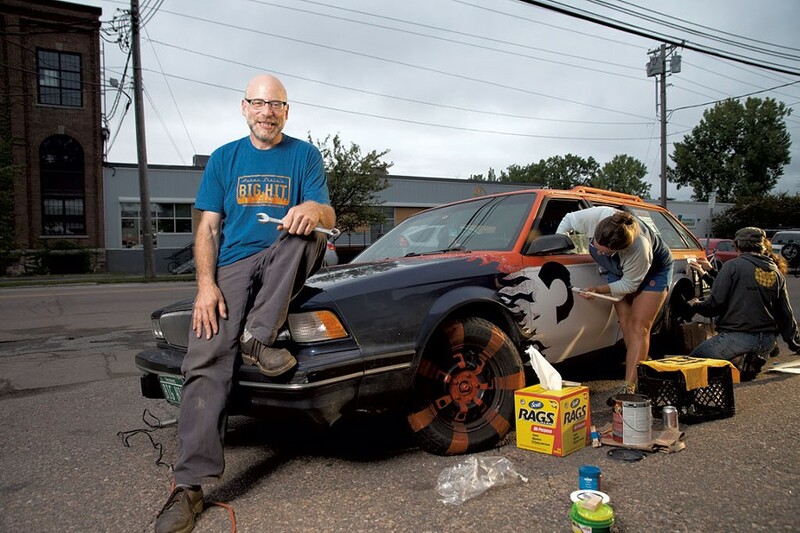 After the derby, Stein says, whatever is left of Eunice Bloom will appear in the juried show at the South End Art Hop from September 5 to 7, though he plans later to strip the car for parts to use in future artworks. "To complete the story, I'll probably take it up to Rathe's Salvage and they'll crush it," Stein says. "And I would like to video it being crushed and have that full circle, to recycle it into another car." The original print version of this article was headlined "Crash-Test Artist: Aaron Stein Takes His Auto-Art to the Derby"